This isn’t even close to true. The Star Tribune’s claim is completely baseless and false. The Ferentz contract is about the most absurd single example one could come up when trying to argue that Kill is one of the lowest-paid coaches in the country at a major program. 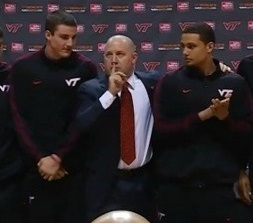 A week ago we walked through some specifics on the contract between Buzz Williams and Virginia Tech. The traditional media might continue to dream up a fact pattern that concludes Buzz Williams took a gigantic pay cut to get out of Milwaukee. Reality doesn’t support such a claim. Just this month, Marquette filed their annual Form 990 for the year ended June 30, 2013. Late Night Hoops compared their reporting of Buzz Williams’ pay each year over the past several years. The trends illustrated in this article give rise to the possibility that pay might have been a source of frustration for Williams. In the past we have brought up the inaccurate claims that were on Minnesota AD Norwood Teague’s bio, specifically around a new basketball practice facility at VCU. Teague came to the Twin Cities from VCU and was touted as a big time fundraiser. Many believed (and still do) that he had constructed a basketball practice facility in Richmond, but he had only suggested a facility be built for around $10 million with private funds. That amount quickly grew to an estimated $14.5 million. The project’s estimated cost has risen to $25 million. VCU says a significant factor in the increase is that when new AD Ed McLaughlin arrived in 2012, he determined the current plans wouldn’t work from a Title IX perspective. A new, larger location that could better accommodate both the men and women was needed. Private funding wasn’t going to get the job done. The school announced they would reallocate student fees to help pay for the project. There has been clamoring from some students, but after another strong season (until last night’s loss) support for VCU basketball is very high. Per review of a draft of the Executive Committee’s minutes from earlier this month, VCU’s board has approved entering into a line of credit agreement to front the money needed for construction. This should enable the project to get started (shovels in the ground) this spring, with completion possible before the start of classes in fall 2015. Last summer Norwood Teague announced his idea of a $190 million facilities plan for the University of Minnesota. We found the idea to be borderline absurd [See: Minnesota’s Facilities Plan Set Up For Failure – July 10, 2013] and still do. Things have been quiet since last summer, but we understand a “fundraising feasibility study” has been “wrapping up”. According to consulting firm Pleasant Avenue Athletics (PAA), the University of Minnesota may still be on the hook for $225,000 related to APR incentives in Tubby Smith’s contract with the school.